I am a member of the #CollectiveBias ® Social Fabric® Community. This shop has been compensated as part of a social shopper amplification for Collective Bias and its advertiser. Next week, on January 31 the Chinese New Year begins. It is the year of the horse. And for Konrad and I it will be our first Chinese New Year that we spend back home in Canada after our Asia trip. For the past 2 years we have experienced Chinese New Year celebrations in Thailand and Vietnam. In Thailand Chinese New Year isn’t an official holiday but rather it is only celebrated by the large Chinese community in Thailand. It is mainly a family celebration within the homes. The few observable elements are some decorations, mainly Chinese lanterns hung across the streets and house entrances and lighting of very LOUD firecrackers. 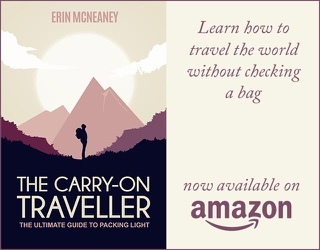 You can read about our first encounter with these firecrackers on the small travel diary we had back then. In Vietnam, Chinese New Year is also the Vietnamese New Year, called Tet. We arrived in Ho Chi Minh City a week before and we could see and feel the whole city preparing and gearing up for the big celebrations. Close to where we stayed an entire park was converted into a giant flower market. Plants with yellow blossoms (picture in linked post) were particularly popular and many house entrances were decorated with them. There were many more elements to the festivities that we didn’t really recognize as we had just arrived in the country and were still trying to figure the city, country and culture. For our own Chinese New Years celebrations back home in Canada I was thinking to take more of a Thai approach to the festivities. In many different cultures the evening of CNY is marked by a Reunion Dinner where extended families gather and eat, of course. 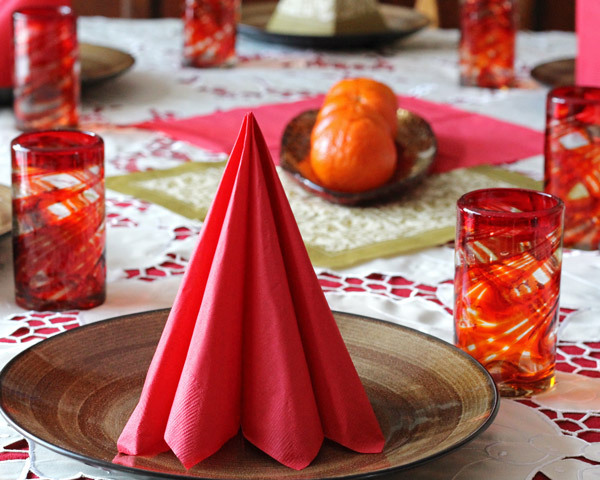 I set our family dinner table in the traditional, celebratory colours of red and gold (symbolizing luck and wealth respectively) and invited some family members who weren’t familiar with any Chinese New Year celebrations at all. 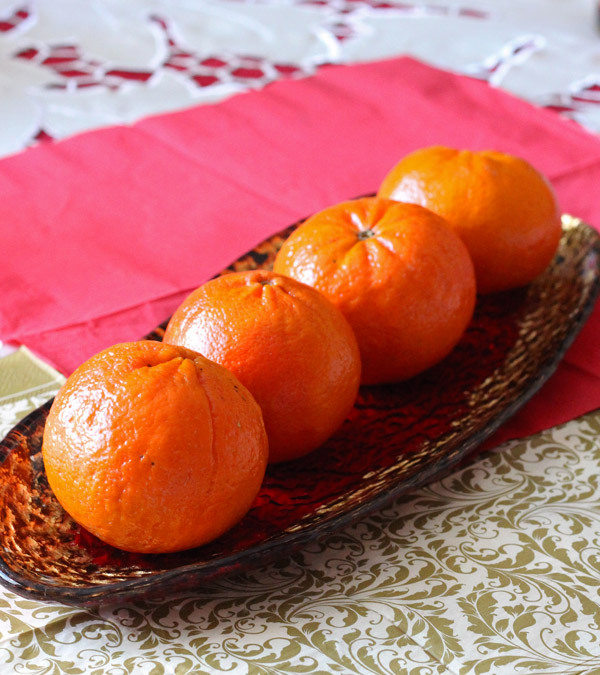 Oranges and tangerines are also part of Chinese New Year celebrations, since their names sound like luck and wealth. 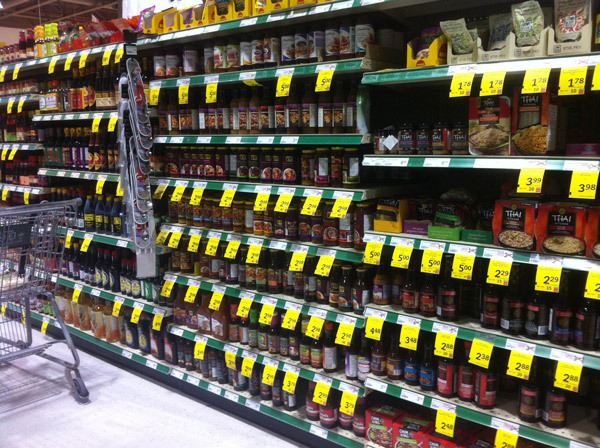 To shop for our ‘Reunion Dinner’ I went to Sobey’s to pick up some great fresh produce (not quite but pretty close to going to the market in Asia) and some VH Stir-Fry sauce. I was happy to see that so many of their products happened to be on sale. 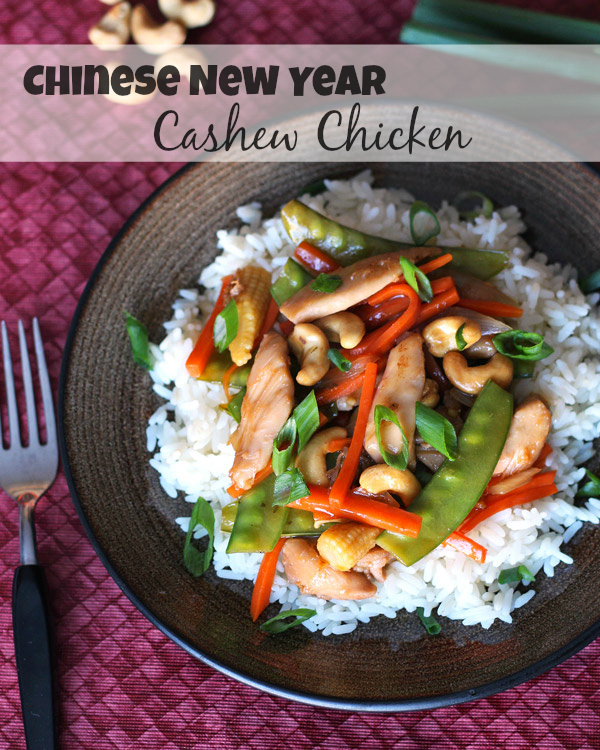 I made Cashew Chicken inspired by one of our favorite meals of our 1.5 years of travel. This cashew chicken was served at a family-run food market stall in the Thai town we spent most of our time in (Krabi). The family was of Chinese origin, so this meal seems a lot more like ‘Chinese food’ than Thai. No surprise, for the week of Chinese New Year their market stall was closed. 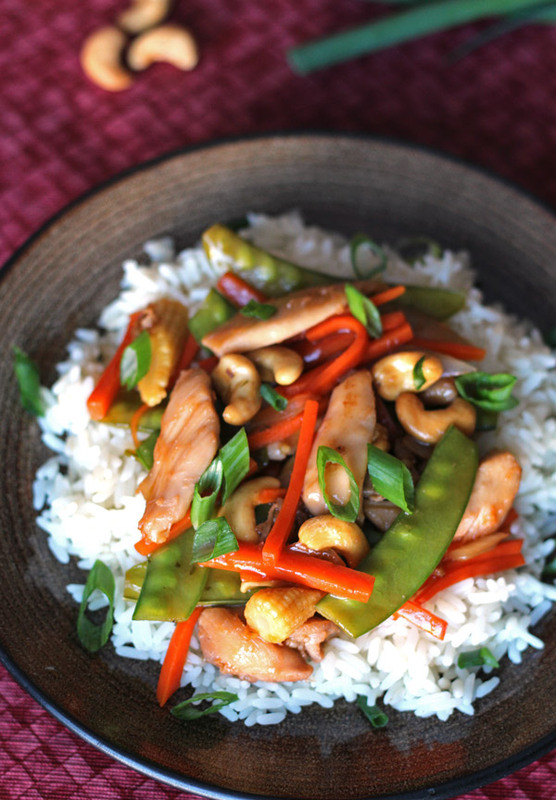 I also have an updated recipe for Thai Cashew Chicken Stir Fry here. 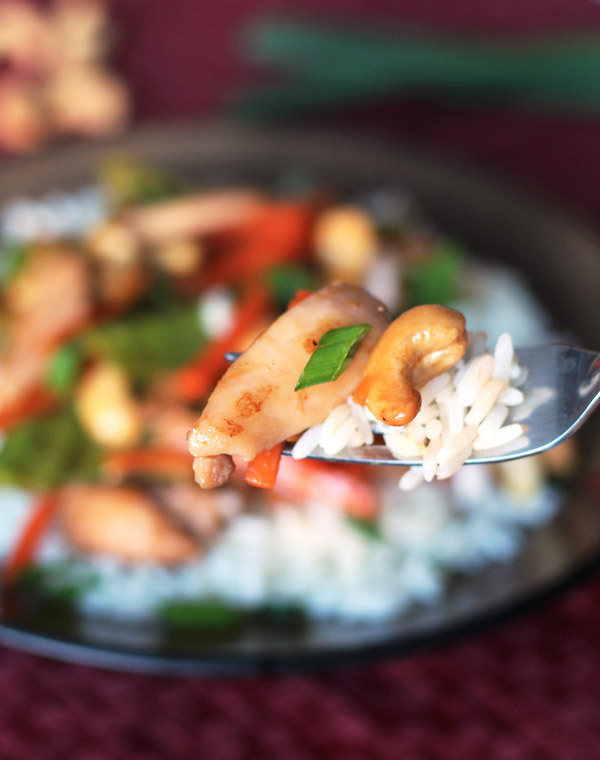 Of course, as the name says, this meal is about cashews and chicken. But the vegetables are really important too. Don’t overcook them in this meal. Veggies with crunch retain a lot more of their nutrients and add wonderful texture to the entire dish. Cut the chicken thighs into bite-sized strips. Heat 1 tablespoon olive oil in a skillet, add chicken and cook until juices have cooked off and the chicken pieces are nicely browned. Set chicken aside. Heat another 1 tablespoon of oil in the skillet and add onion slices. Saute a couple minutes until onions are just starting to soften. Add baby corn, snow peas and carrot sticks and saute the vegetables until they just start to soften. Add chicken to vegetables and stir in sesame oil, VH Orange Ginger Stir-Fry Sauce and chicken broth. Bring to a boil and cook for 1 more minute. Stir in cashew nuts just before serving. Serve over rice and sprinkle with green onion. I wish you all a wonderful and happy Chinese New Year!